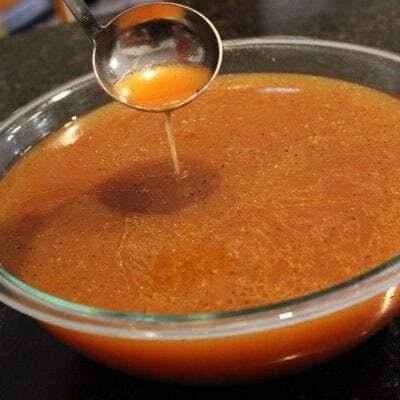 Now that you’ve made the perfect roast chicken or the perfect roast turkey, and diligently saved the bones and bits, let’s get to making some chicken stock or turkey stock. Be cautioned that I am not a stock purist. This method will not yield a clear straight protein based consomme, instead it makes a delicious savory opaque stock. TIP: Save your bits! When we have chicken or turkey with dinner, I always throw the bones into a large bag in the freezer for making stock later. The more bones your stock uses, the more rich and flavorful it will be. I also have a second freezer bag for vegetable bits. Carrot peels, celery tops, onion pieces, garlic husks and even the occasional apple go in! Chicken or turkey bones from a previously cooked bird I don't make stock unless I have at least the equivalent of 2 carcasses, but if you're making a small batch you could surely do less. Chicken or turkey bits skin, neck, giblets, gristle and any other uneaten bits. Add your ingredients to a stock pot and cover with cold water. Bring to a boil and then immediately reduce to a slow simmer. Strain twice, I strain first with a colander for the big pieces and a second time using my metal mesh strainer for the little bits. Allow to cool, then remove fat that has settled on top. Your stock should cool to a gelatinous state, this is due to the gelatin found in the bird's bones and cartilage. Chicken or turkey bones from a previously cooked bird (I don’t make stock unless I have at least the equivalent of 2 carcasses, but if you’re making a small batch you could surely do less). Chicken or turkey bits (skin, neck, giblets, gristle and any other uneaten bits). Allow to cool, then remove fat that has settled on top. 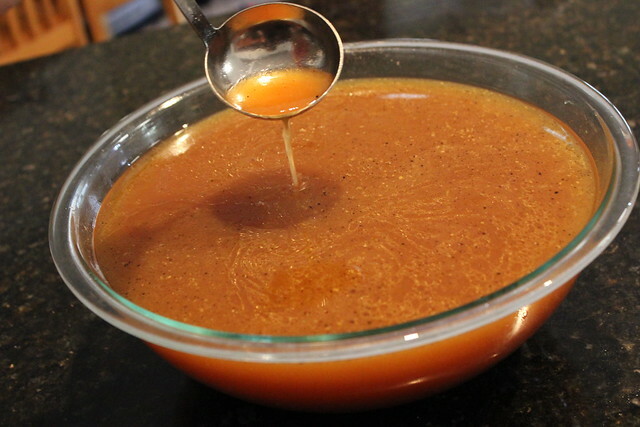 Your stock should cool to a gelatinous state, this is due to the gelatin found in the bird’s bones and cartilage. Homemade stock is the best! Terrific blog, by the way. Keep up the good work! If you want extra clear stock, freeze it then let strain through a piece of muslin as it thaws. This will allow the clear liquid through, whilst leaving everything else stuck in the globules of fat, which will be too coagulated to go through the muslin.